I had a doze of reality from living with cancer. One of the things my oncologist want to do before leaving for vacation was to have an ultra-sound scan of my abdomen to check on something he felt. Well, I had that done that last Friday, July 12. I got the results and they were good. “Hernia or ascites as questioned is not identified…” (Thank you!) Then early this morning I had my blood test to check on my CEA level (tumor marker count) to see if there is any cancer activity. I will know the results later. I am 20 years older than him and I am not taking any maintenance medication, but my body is battered with chemo toxins and tatooed by surgical scars. What would I give for that 34-year old body! I think about the many marathons I could have run and personal records broken. Blood pressure problems are preventable. Back in 2007, I took up running to wean myself of blood pressure pills. The irony is I got rid of it but got cancer instead, but the point is you can still enjoy life (or food) and still take care of your body. Mine involves periodic checkup, scans, blood work, exercise, and diet. I treat my body with respect, like a sanctuary or a blessed altar that one pays tribute to. It allows me to be here with you. This summer I see car or motorcycle enthusiasts cleaning their cars and bikes with enviable diligence to show off their proud work. If you think about it, it is the same effort and diligence when translated to maintaining healthy bodies. I am no doctor (nor your mother) but each time you take a swing at that beer bottle or eat unhealthy food, just think of me. I wish I had that 34-year old body with blood pressure problems instead of cancer. P.S. Over the weekend, we did 6 miles for our long run. I am home. While it has been a wonderful two weeks in the Philippines, I miss the US, my kids, and grandson Ethan. As I look back on this trip, I could not help but appreciate all the blessings and the memorable moments I had on this trip: It is enough to be a book. I still glow in the after thoughts and memories of the trip. Time, a precious commodity in Manila due to never ending traffic congestions, was given to me freely that it left me in awe and feeling blessed. I remember when I was first diagnosed with cancer and had asked the question “why me?” I had bitterness and resistance in accepting my new fate back in March 2008; I was being robbed of my future. Now, it has come back in full circle. As my cousins, aunts, nephews, and nieces prayed over me on the eve of my departure, I asked “why me?” Do I deserved this? This time around I did not have the same bitterness or resistance. I felt love and support that I did not realize could come from my extended family. 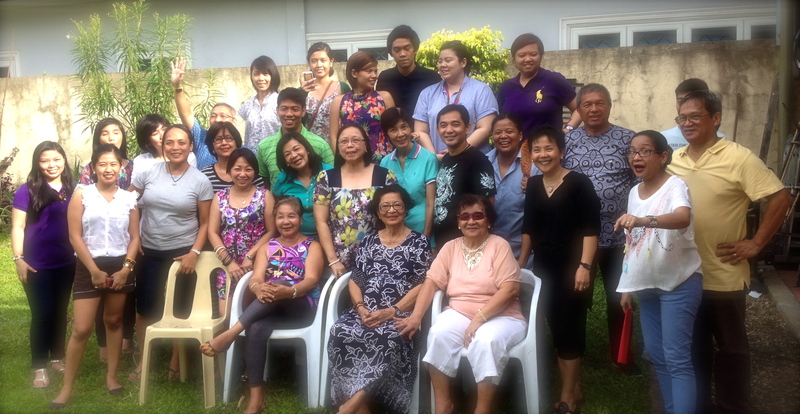 I felt energized and loved inspite of my years of absence from family reunions, birthdays, and occasions. It was a renewing experience for me, a rebirth, which was blessed by the unity of their healing prayers for me. Second Nones family reunion on eve of my departure. My mom seated second from right. One thing I have learned from living with cancer. You need not look beyond what you have to see the beauty of life. Life is in the form of families and dear friends, not in objects of possessions. Of miracles granted and denied. I had an aha-moment while accompanying my wife to the Church of Our Lady of Perpetual Help in Baclaran, a district in Metro Manila. 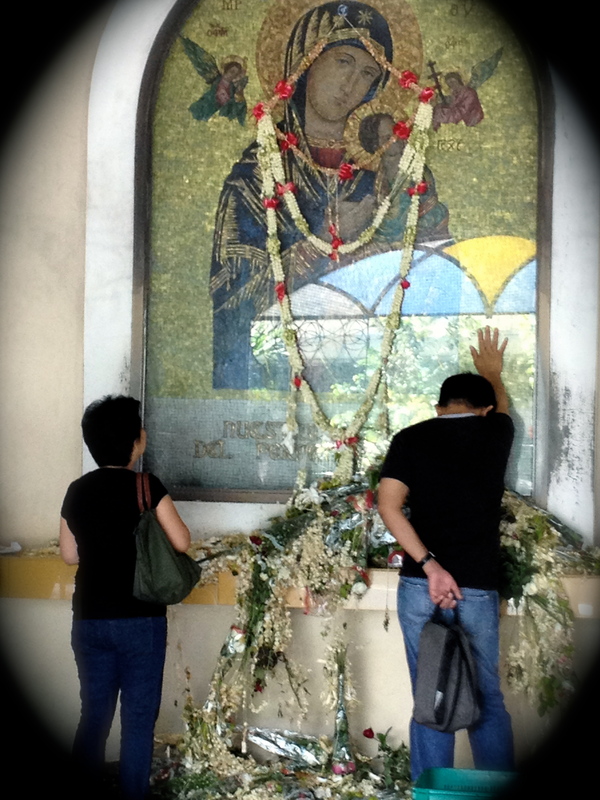 I had touched upon the devotion of Filipinos to religion and the Baclaran visit is one of those must-do trips my wife had to do. The church is usually packed with church-goers every Wednesday, when they have masses and novenas almost every hour from 5:30 am to 7:00 pm. We avoided the crowds (and pickpockets), so we went there on a Thursday. Since I was a boy, my parents would go there for Sunday or Wednesday masses with the family in tow at times. I did not understand the significance of it back then, all I know there will be a treat for me at the end if I behave. I remember the people going in with candles, sampaguita flowers for offering, and booklets of prayer books and rosaries on hand. I grew up thinking this is how every church in the world looks like: full of people. However, only in Baclaran, you would see the streets and side-walks packed with street vendors and hawkers, selling everything (and I mean everything outside of religious things) from clothes, food, flowers, notebooks, slippers, etc. It is a hawkers paradise, and an in-your-face assault on the senses. It is a custom for devotees to walk the center aisle of the church from the entrance to the altar (about 70 meters) on your knees while praying the rosary. My wife told me that she did the length of the aisle back then to give thanks from a life-threatening surgery, but now only managed to start from the half-way point (tsk…tsk, marathoner). I knew she was praying for me. She is among those who come this is place to ask Our Lady of Perpetual Help for relief, petitions, and in my case a miraculous cure for my cancer. One of the hundreds, of thousands, who come to this place; like at the Shrine of Kamay in Hesus (Hand of Jesus) in Lucban, Quezon province, to pray. It is also in this place that I realized that the miracle that everybody so wishes for me is already here. It is a miracle that I have reached this far in my struggle with cancer and be in the presence of Our Lady herself. The miracle is in front of me, not in a literal sense, but in the form of each day given. My miracle is about coming back and realizing it has been answered. Perhaps my parents knew I would need lots of help from Our Lady when they brought me to this place when I was a boy. Or perhaps I needed to go on this cancer journey to tell you: You too can have the miracle you deserve when you start believing in miracles. Image of Our Lady of Perpetual Help surrounded by flowers. Wife Irish on the left praying.